HUEY JANN ELECTRONICS INDUSTRY CO., LTD was established in 1989 manufacturing Hi-Power LED, Extra Bright LED, and Infrared Emitter LED. Our design and production expertise, coupled with leading edge automation equipments allowed us to manufacture high quality LED products. In 1990 we constructed a brand new manufacturing facility in Phase II of Wu Chi Industrial Park to satisfy market needs and to improve services to customers. During 1991, 1996, 2000 and 2008 we expanded our production line. In order to meet the requirement of illumination market, we mass-produce 1W-100W High Power LEDs with High Lumen , High-Performance and High CRI 90. We installed leading edge automation and measuring equipments to significantly increase our mass production ability and to fulfill customer needs quickly. Quality, Innovation, Service, and Breakthrough are Hey Jann Electronics’ philosophy since the company’s creation. We promise prompt and personalized service to our customers. Doing our best to fulfill your needs is our mission from top to bottom. That only specialization and deep domain knowledge will satisfy our customers! We provide expert training to all employees to provide bleeding edge domain expertise. Such expertise will help guide our customers, and provide them with relevant insight and skills to lower development risks and to enhance customer’s profitability – Win-Win scenario. In order to take advantage of technological advancements and keep pace with sustainability trends, we move forward rapidly with low watt, higher efficiency, energy savings, higher usability and broader applications. This in turn creates sustainable environments and business. Our main product lines are high quality HI-Power LED, Extra Bright LED, IR Emitter & Receiver Module, SMD LED, etc. Our company is dedicated to Green technology as well. Our constant innovation allowed us to provide higher levels of power saving LEDs. Our 10W, 20W, 30W, 50W, and 100W are currently the brightest LED in the market. In fact, due to improvements to the production process, brighter, more uniform, have a longer life, better quality, and Higher CRI over 90. They are useful in streetlight, car light, and interior and exterior lighting systems. The GalnN/GaN and Blue, White LED. They are mostly used on billboards, traffic lights, automotive tail light, building auxiliary lighting system, optical mouse, etc. The infrared emitting diodes are mainly used in CCTV camera, medical devices, remote control, auto door sensor, smoke detector, and CCD auxiliary lighting system. We mass-produce High Power LEDs with High Lumen , High-Performance and High CRI. The main color temperatures of white LED contains 8000°K for cool white, 6000°K for pure white, 4000°K for natural white and 3300°K for warm white. We use precise measuring instrument together with integrating sphere to give you optimal color and brightness settings. Further more, our 50W and 100W module are made of copper based foundation, stainless steel cover and glass lens. Brightness is higher, the water proof ability is better and the outward appearance is firm and solid. It could be efficiently applied on street light and outdoor lighting application. By precise color sorting during manufacturing process, to minimize chromatic aberration in large-area application. Small heat dissipating area, broad applications, etc. We have a global customer base including Europe, Americas, Asia, and Middle East. We maintain a 20% to 60% high growth rate every year. Our service team work hard to understand customer’s practical needs, assist in solving various design and development challenges and replying customers’ requirements in time. We also continuously provide LED optoelectronic information which meet customers needs the most. For a long time, we always insist on providing three main services-- professionalism, efficiency, and satisfaction, and gain long term support and faith in both domestic and international markets. 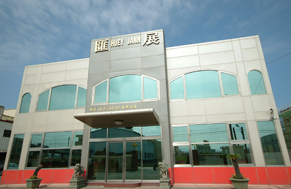 Huey Jann Electronics’ business strategy is to be based in Taiwan yet does business on a worldwide scale. We strives toward a trilateral win-win scenario – lead the LED trend and invest in a highly effective R&D team to increase value-added Hi-Power LED products with high quality, and to enhance customer profitability. We believed in our “Quality, Service, Innovation and Breakthrough” philosophy. We continue to grow and improve ourselves in the LED industry. We strive to provide high quality and high levels of customer satisfaction across the world to become the best-in-class supplier. We will continue to incorporate sustainability and Green products to create an environment of sustained growth. Huey Jann Electronics Industry Co., Ltd. Established. Moved into Wu-Chi Industry Park with the expanded facility scaled 5000 square meters. Started mass production of Radial type IR/PT products. Started automated production of Extra Bright LED used in traffic light and blanking LED. Started automated production of Axial type and SMT Opto-electronics products. Increased automated production line of Laser Diode. Expanded production line of Laser Modules. Expanded production line for traffic light market. Increased the brightness of Extra Bright LED and expanded the production line. Expanded production line of Extra Bright LED, IR LED, SMD LED. Developed High Power LED driven by 350mA (1W). Started mass production of High Power LED driven by 350mA ( 1W). Developed well anti-ESD capability products (8000Vesd) and went into volume production. Finished the test of High Power LED 700mA (3W). Started mass production of High Power LED 700mA (3W). Finished the test of High Power LED 1400mA (5W) and went into volume production. Developed and tested 10W, 20W, 50W and 100W High Power LED and went into volume production. Started mass production of PLCC6 products. Developed and tested 50W and 100W High Power LED Module and went into volume production. Produced 15W and 30W High Power Light Bar LED and 100W LED Module. Started mass production of High Power LED featuring 105lm/W. High Power LED 7200lm/100W, 3735lm/50W, 820lm/10W, 1500lm/20W and 2300lm/30W LED went into volume production. 2010.01 Producing 125lm/W of Hi-Power LED massively. 2010.03 Producing CRI 90 of Hi-Power LED massively. Producing 132lm/W of Hi-Power LED massively.